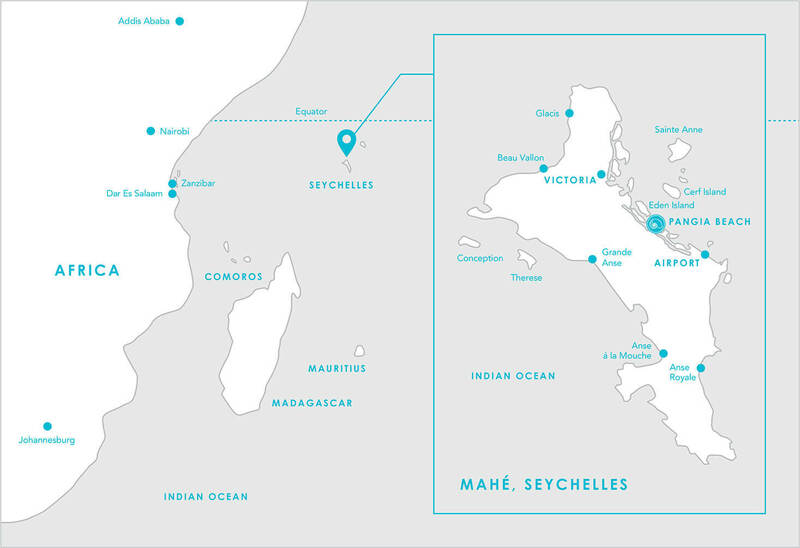 Anchored in the warm, tropical waters of the Indian Ocean is the Republic of Seychelles. Here, pearl-white sands are caressed by crystal clear, turquoise waters and the imagination is captured by green rainforests, majestic granite rock formations, multi-coloured coral reefs and picturesque mountains. Pristine and tranquil, with an abundance of flora and fauna, the Seychelles is comprised of an archipelago of islands located off the northeast coast of Africa. Like jewels, this cluster of 115 granite and coral islands shine with natural splendour. Renowned for this timeless beauty, year-round warm climate and world-renowned beaches, the Seychelles is, undoubtedly, the archetypal tropical paradise. Found on the largest island of the Seychelles, Mahé, and conveniently located between Victoria and the international airport, Pangia Beach is your gateway to island life. to exploring gorgeous hiking trails, or playing a round of golf. including fishing, sailing, snorkeling and diving, and is just a stone’s throw from the Sainte Anne Marine National Park, which is blessed with the world’s most beautiful tropical fish and coral life. For the more cosmopolitan-minded, Pangia Beach is just minutes away from the shops and restaurants of Eden Plaza, while the private marina offers the perfect starting point for a cruise in your boat. From cocktails on your terrace, to lazy days by the resort’s infinity pool, at Pangia Beach you are truly spoilt for choice.